I finally bought an e-book reader last week. I had been resisting them for a variety of reasons, the most prominent of which seemed to be “I don’t need it.” Well, of course I don’t need it. Does anyone really “need” an e-book reader, when regular books have worked just fine for hundreds of years? Well, actually — if you think about it — librarians sort of do. The reason I say that is because many of our patrons have them, and want to use them to access the downloadable media available from the library, and it would be good if the library staff knew how to help them do that. And to that end, the library where I work decided to offer an incentive to staff members to purchase of an e-book reader. Sure, they had some on hand that staff could play with, but it’s not really the same as having one that you can make your own, really get to know it (and love it). I decided to go for it… Why not? I’ve only had it for a week, but I must admit (sheepishly) that I already rather love it. The first thing I did when I got it out of the box was put it into its case. Next, I charged the battery (via the included USB cable). I figured out how to connect the device to my Amazon account (which is how you get content on to it). Then, I read the User Guide, which comes pre-installed on the device. I know that might seem counter-intuitive in a way, to only give you a user guide that is on the device, but the darn thing is just so intuitive in general, that you can’t miss it. It’s right there, when you turn it on, and you just click on it and start reading. Plus, I suppose it’s probably also one of those “immersive” learning strategies; it forces you to learn by doing. Once I had the tools I needed, I set out to get some new content on it. I looked up some classics — like Pride and Prejudice or The Odyssey — on Amazon and found that many of them are free. Yes, free. Like, zero American dollars. On the one hand, that of course makes sense because the text of those works are in the public domain. But I must admit, I was skeptical whether that would be the case or if Amazon would have found a way to justify charging a nominal fee since they took the time and effort to create the Kindle version. But apparently not, so: Yay for free content! 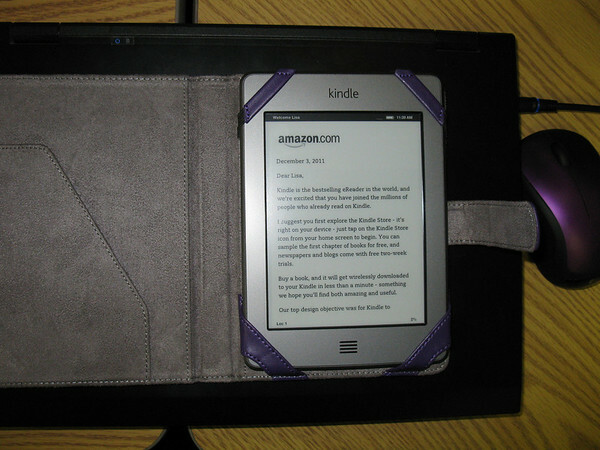 Speaking of free content, next on my list was to figure out how I could borrow library e-books using my new Kindle. Now, the ability to get Kindle books through OverDrive is a rather recent development. Until a couple of months ago, it was not possible to borrow library e-books on a Kindle. But, that is no longer the case. However, that being said, there are some aspects of this new feature that many librarians are not very happy about. Sarah Houghton, of the Librarian in Black blog, sums up those concerns better than I ever could (just FYI: her video blog contains language not suitable for work). But the short version is: when patrons borrow e-books on a Kindle, the book actually comes from Amazon and so Amazon is able to keep a record of that transaction, which is counter to the privacy mandate to which public libraries generally adhere. So, as a librarian, I feel obligated to mention that. As a consumer/patron/Kindle owner, it doesn’t bother me, because I have made the (informed) decision to be okay with the fact that Amazon knows what I’m reading. (They keep a record of all the stuff I buy from them, too, and yet I keep shopping there, so I suppose I’m used to it.) But Ms. Houghton definitely makes some valid points, so check her out. But back to my experience with my new toy. I went to the Dayton Metro Library’s Downloadable Digital Media Library and searched for a book. Once I found one that was both in the catalog, available in Kindle e-book format, and had copies available, it only took a few clicks to “get” the book. I had to “add to cart”, put in my library card number, and then click “Get for Kindle.” I did have to login to my Amazon account (which is where the privacy issues come in) so that the book could be added to my device (because the device is linked to my Amazon account). The e-book then showed up on my list of e-books (with the notation “public library” next to the title). Once I re-synched my device (by connecting to wireless internet and clicking “synch”), the book showed up on my list there, as well. The borrowed e-book works just like my other books, except that in a couple of weeks I expect that it will disappear, once the loan period expires. As a library patron, whatever the reason, the point is that if you don’t find what you want in one library e-book catalog, you should check the catalogs for other nearby libraries. They might have a book that your library didn’t have, or they might have more copies or copies available when your library did not. (For example, I ended up downloading Lev Grossman’s The Magicians from the GCPL because GCPL’s catalog has 9 copies, and one was available — as I write this, there are currently 4 of 9 available — whereas the DML catalog only has 2 copies, both of which were checked out. The integrated dictionary. I was always bad about actually looking up words I didn’t know, when reading. I’d try to get the gist from context and failing that, I would usually just hope it wasn’t too important, rather than trudging off to find a dictionary. While reading on my Kindle, if I see a word I don’t know, I can just “press and hold” on the word, and the dictionary pops right up. Now there’s no excuse not to learn exactly what that word means, right then and there! The overall design: the fact that it’s a flat, touch screen. It’s so much easier to read while eating, lying in bed, or even on the couch. I don’t have to hold the book open. I barely need to lift one finger (literally) to advance to the next page (just press anywhere near the right side of the screen). I mean, I know reading is a pretty sedentary, motionless activity to start with…but that one-finger page-advance feature makes it even simpler. I have to say, I am loving the ability to just prop the thing up against my computer at my desk and read while eating my lunch, which leaves both hands free except when I have to turn a page — so as long as I keep mayo or pizza sauce or garlic bread crumbs off at least one finger, it’s all good! The instant gratification. Especially with the library downloadables and the public domain classics, both of which are free. As long as you are somewhere with accessible wifi, you are just a few seconds away from reading a new book (or an old one). You can also buy Kindle books right from the device itself, although I am trying not to get into the bad habit of doing that…it’s so damn easy, it could get expensive quickly! Oh and one last thing about Kindle. The $99 one does have “special offers” (ads), but they only show up in a small banner at the bottom of the Home menu (like when you are trying to decide which book to read today), or when the Kindle is in power-save mode. There are no ads on the screen when you are actually reading a book. And if you really, really want the ads gone, you can pay an extra $40 any time and get rid of them permanently. I’m glad I didn’t splurge for the ad-free Kindle to start with, because I really find the ads quite unobtrusive and not worth $40 just to be rid of them. After reading “City and County Directories: Hidden Treasures” on the Ohio Historical Society’s Collections Blog, I was inspired to share some details about the historical local directories available in the Local History and Genealogy departments at the Dayton Metro Library, where I work. Early Dayton city directories in the DML Genealogy Dept. Historical directories are useful in many ways, particularly in genealogical research, as well as research pertaining to a house, building, or business. In all the directories, you can look up a person or business by name. For people, the information provided generally includes name, occupation, place worked, place lived, and sometimes their spouse’s name (if any). Very old and very new directories generally tend to include only the name of the head of household, but I have noticed that many times the directory lists each adult resident of a household separately and sometimes teenagers (usually identified as “students” for their occupation). Some uses for directories in genealogy would be to find out where your relative lived or what their occupation was. If you check every year, you will probably find that they moved or changed jobs over time. When you suddenly notice the presence or absence of that person or a spouse in a particular year, you can get clues to marriage/divorce/death/moving dates. Keep in mind: it’s just a clue, so you must always verify! But at least it can help give you a good idea of “when” to start searching for a particular event. Wright, Orville, office 1127 W 3d, also Pres The Wright Co e s Coleman Av s of 3d, res Oakwood. By 1914, Wright had moved to his new mansion Hawthorn Hill in Oakwood, but as he still had an office in Dayton, he still had an entry in the city directory. For businesses, the information provided in directories generally includes location and type of industry (e.g., if it’s a factory, it will tell what they manufacture), usually the name of the business owner, and sometimes the names of other company officers. As the OHS blog post stated, schools, hospitals, hotels, and many other types of buildings/businesses are also included in directories. I like to think of directories as being like telephone books on steroids: they include basically everything you would find in a telephone book, plus more. One of the biggest “plus more” aspects of directories is that directories eventually began to include listings that made it possible to search for a particular address and find out what was located there. In the case of Dayton city directories, the earliest year you can search by address is 1914. 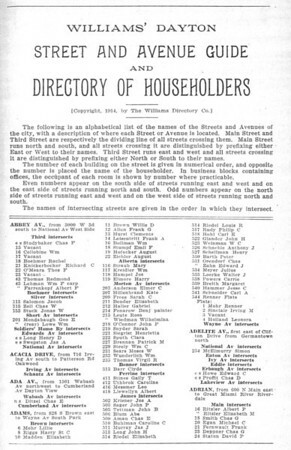 These listings are in the back of the directory, with street names listed alphabetically. Under each street, the numbers are listed in ascending order, with the name of the person or business next to it. If you are interested in more information about that person or business — now that you’ve found out the name — you can search for that entry in the front (alphabetical-by-name) part of the directory. Being able to search by address is especially helpful for people researching the history of a house. Directories include the names of the residents of a house, as opposed to just the owner’s name that you would find on a deed. Many times, house researchers just want to know a little about the families that lived in their home before they did. Sometimes, people think they have a ghost, and learning about the previous residents can help them figure out who might be haunting their home. In another example, I recently helped someone who had found some photographs tucked away in his historic home, and he was trying to find the family to whom the photos belonged, so he could return them. And now that we’ve talked about some of the ways that historical local directories could be helpful in your research, I’ll give you the specifics on what we have at the Dayton Metro Library. 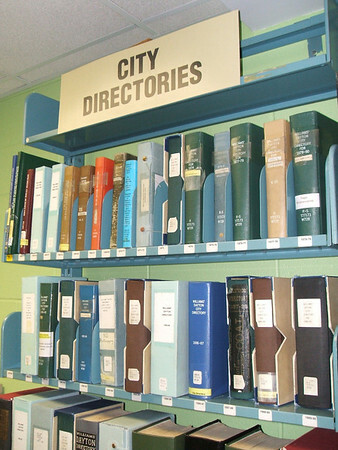 We have four types of historical directories, all of which are available for public use: city directories, suburban directories, Criss-Cross directories, and telephone books. Later years can be searched by telephone number to get the person’s name. Search by telephone number to get the person’s name. Cannot be searched by address. The materials discussed here are available in the Magazines & Special Collections division of the Dayton Metro Library, located in the basement of the Main Library, 215 E. Third St., Dayton, OH 45402. They are available for public use anytime during regular library hours. If you are unable to visit the library, a librarian can assist you with requests that are “clearly defined and limited in scope.” If you need a quick look-up in the directories, please submit an electronic reference question. For other questions about directories, you can contact the Dayton Metro Library or leave a note on this blog. This past weekend, I traveled to Muncie, Indiana, for a conference about CONTENTdm. The conference was on Friday and Saturday, but I went up a day early and explored Muncie (in the rain). 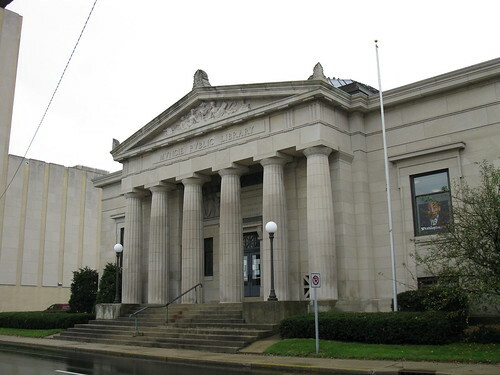 The first place I wanted to check out was the local history and genealogy department of the Muncie Public Library. Yes, geeky, I know. I knew from the library’s web site that I would be looking for a Carnegie library building. However, when I arrived, I got a little confused about how I was supposed to get inside, as I was parked near the back of the library, but there was this other building across the alley that had “Local History & Genealogy” etched in stone above the door (but was not attached to the Carnegie building). I tried to open the door, but it was locked. I know this place said it was open on Thursdays, I thought to myself. Then I saw a truck pull up, and a man wearing some kind of emergency responder uniform got out, and entered the locked building using a key. Hmm…that’s weird. Why would the library be locked? I didn’t make it all the way to the front of the building at that particular moment, but I found out later that it wouldn’t have done any good anyway. During my later walk around town, I came back to the library from the front and noticed that you can’t get in the front doors anymore; they don’t use them (“emergency exit only”). But let me take this opportunity to share a picture of the front of the building, because who doesn’t love a good Carnegie? Now, the only reason I am telling you the details of this story that makes me look like a dolt…is to highlight the dedication to public service of that librarian (whose name turned out to be Cindy). It’s one thing to help someone who’s already standing at your reference desk. But this woman went far out of her way — even out of the building — and into the rain — to flag me down and help me find my way. Now that, my friends, is excellent public service. Once we were inside, she said she had seen me walking around in the alley and that I’d tried to get into the other building across the way. 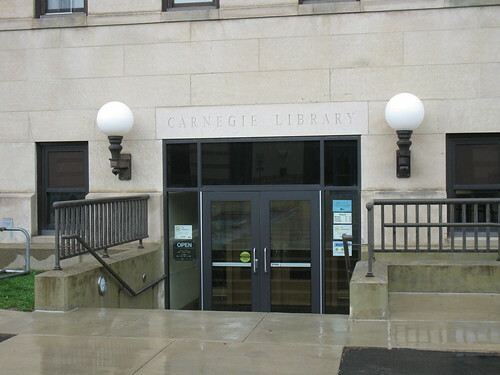 She explained that the Local History department used to be in that other building, which they had built new a few years ago for that exact purpose and that the Carnegie building had been a regular branch library. 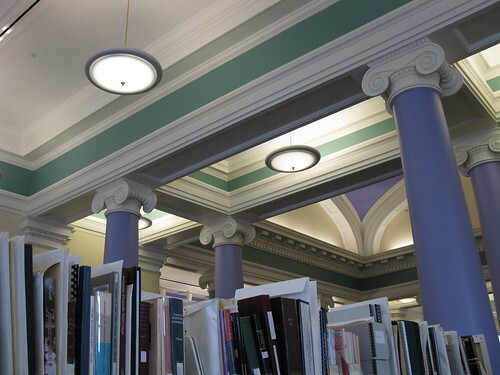 But then with budget cuts, they couldn’t keep both buildings as libraries, so they moved Local History back to the Carnegie building and rented out the other one to one of the local government offices. They figured the newer building would be easier to rent out…plus the Carnegie Library already looked like, well, a library. Then she asked me what I was looking for, and I said, “Well, nothing in particular.” Then I explained about being a local history librarian from Dayton and how I was curious what their Local History department was like. So she gave me a full tour. 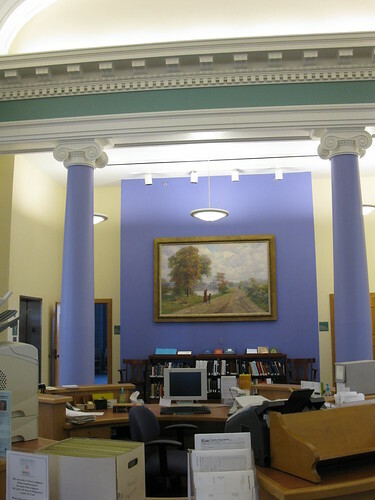 The Local History and Genealogy division has the majority of that Carnegie building all to themselves, with a small circulating collection and a computer lab on one half of the lower level. But the other half of the basement and the entire first floor were dedicated exclusively to LH&G. In addition to public computers specifically for LH&G use, they also have two flatbed scanners for patron use. This is something that the Dayton library has not embarked upon, although it has been discussed. They had a nice little bookshelf where they display new items. There is a New Items section at the Dayton library, but we do not have one specifically for new local history items. They have work study students from the university scanning items for their digitization projects. 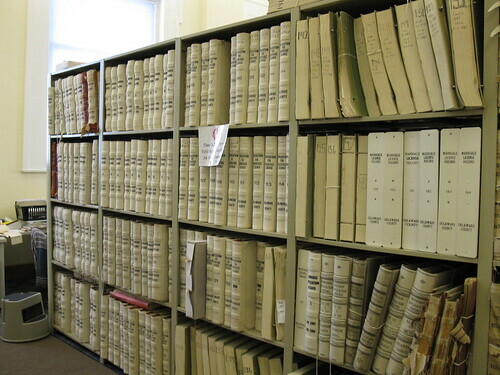 (They have scanned many kinds of records, including deeds and wills.) However, while the digitization itself is awesome, I was more intrigued by the idea that they are able to get work study students to do this work: meaning, the students are paid by federal work study, so it is low-or-no cost to the library, yet it gives them a staffing resource to work on these projects. I later asked the department manager about it, wondering aloud whether we could benefit from a similar program. Her response: “You never know unless you ask.” Too true. As I understand the story, Delaware County (in which Muncie is located) is now on its third courthouse. When the second courthouse was slated for demolition in the ’60s or ’70s, apparently many of the original record docket books were in danger of destruction as well (for reasons not fully explained to me). Apparently, a Ball State University history professor caught wind of this and mobilized an effort to save the records, which were then given to the library for safekeeping. And so, there they remain, in all their glory! I’m so glad to hear (and share) this wonderful story of how history was saved and is being preserved. The librarian mentioned that unfortunately, the Carnegie Library is not as environmentally well-controlled as the new building they had to give up (the one across the alley). But, I’ve got to say, any record that exists is better than one that was completely destroyed 40 years ago! What has been your most satisfying experience as an archivist? I responded that, in general, I am most satisfied when a researcher contacts us in the Local History Room about any of our one-of-a-kind items or collections. The fact that this person was able to locate an item of interest in our collections tells me that we must be doing something right. I’m always curious how people find us when they come calling with a specific archival material already in mind. Did they find us on WorldCat, the library web site, a search engine hit, the OhioLINK EAD Finding Aid Repository, or somewhere else? On at least two occasions that I’m aware of, I have received reference inquiries that stemmed directly from something the person read on this very blog (*happy dance*) because the blog entries show up on Google search results. And I think that the reason it makes me happy when people find and use our materials is because that then gives justification to the other activities on which I spend most of my time, which pertain to preservation, arrangement and description, and access to those very materials. Allow me to elaborate. My “the short version of my job” speech begins with: “I have about four hats…” Those hats include: Reference, Processing, Conservation, and CONTENTdm. Reference is the part where I help researchers find answers to their questions; that’s the part where sometimes people ask to use the archival materials. Processing is a shorthand term for archival arrangement and description: figuring out what is in a manuscript collection, putting it in a logical order in boxes and folders, then writing a finding aid so other people (including yourself, later on) can find materials in the collection. I’ve also worked hard to get catalog entries for all our ready-to-use manuscript collections, because our local catalog entries are also fed out to WorldCat, which means worldwide discoverability…which hopefully leads to use. Conservation work, in my case, involves item preservation activities and sometimes repairs (such as rebinding a book to better protect the information on the pages inside). And finally, CONTENTdm refers to the digital asset management system we use to serve up the digitized images and descriptions of our historic photographs, postcards, and other types of documents. So, when you consider that three of my four main job duties involve caring for one-of-a-kind materials, it’s not hard to understand why I get excited when people actually find those materials and want to use them! The people whose approval Samuel mentioned were: M. T. Williams, Joseph Gest, and Joseph Evans. He mentioned in the letter: Rev. William Burke, Oliver Martin, and Joseph Ridgeway. Let’s address the names in the letter one by one, shall we? I’m going to skip M. T. Williams for now. I find his connection the most interesting, so I want to save him for last. First, there’s Joseph Gest. He is listed in Hall’s 1825 Cincinnati city directory as a merchant and city surveyor. There is some interesting (but uncited) information about Gest on the Cincinnati Views web site, stating that he was the city engineer from 1819-1844. More importantly, he was a fellow Quaker. I found his family listed in Hinshaw’s Encyclopedia of Quaker Genealogy, Volume 5 (p. 907), in the Cincinnati Monthly Meeting, and to be sure it was the same family, I checked some later census records. 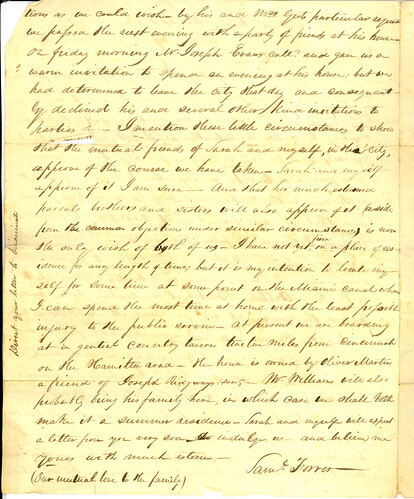 Furthermore, there is a letter in the very collection I’m working with that is addressed to “Joseph Gest, mercht., for Sarah Howard,” at Cincinnati; the letter is from Horton Howard, from Waynesville, to his daughter, dated 11th month [Nov.] 23, 1825. Joseph Evans was a bit more difficult for me to investigate. The 1825 directory lists him as a merchant who lived on Fourth between Vine and Race. There are several entries for men named Joseph Evans (being not such a unique name as “Joseph Gest”) in Hinshaw’s Quaker records, though there was a Quaker man named Joseph Evans in Cincinnati at the time. I expect that may have been the same one, but I can’t be sure. Basically, the same goes for Oliver Martin as Joseph Evans. There is an Oliver Martin who was a Quaker and living in Cincinnati in the right time frame, but I can’t be positive they are the same person. The only Oliver Martin in the 1825 directory was a merchant who lived on W. Market, between Elm and Plum, so a little further away than the others; his store was at the corner of Main and Second. Then again, the Oliver Martin from Samuel’s letter was the owner of “a genteel country tavern two miles from Cincinnati on the Hamilton road,” so may not have lived within the city limits at all and thus might not have been the same Oliver Martin from the directory. Whoever this Oliver Martin was, he was “a friend of Joseph Ridgeway’s son,” according to Samuel. There is no Joseph Ridgeway listed in the 1825 Cincinnati directory. There are several “Joseph Ridgeway”s and “Joseph Ridgway”s listed in the Hinshaw Quaker records. From what I have been able to surmise, Joseph Ridgway Jr. was an Ohio politician who seems to have had something to do with the Ohio canal system – which Samuel Forrer was also affiliated, so that explains how Samuel would have known him. For instance, see the Journal of the Senate of the State of Ohio, Volume 26 [year 1827], Issue 1, pg. 251. The Journal mentions that Ridgway was under the supervision of principal canal engineer David Bates, who happened to be Samuel Forrer’s supervisor as well. And finally, without further adieu, who was M. T. Williams? We already know that he was the man at whose home Samuel first met Sarah. But Samuel seems to almost harp on him. I met Sarah at M. T. Williams’ house. M. T. Williams is my good friend. M. T. Williams threw us a wedding reception. Why all the fuss? Well, as it happened, M. T. Williams was kind of a big deal. I had little trouble figuring out how Samuel Forrer knew him. Micajah Terrell Williams was Cincinnati’s representative to the Ohio House of Representatives in the mid-1820s and was even Speaker of the Ohio House in 1824-25. He was one of the principal promoters of building a canal system in Ohio and when the project was finally undertaken, he was very involved with it and was appointed one of the seven Canal Commissioners in 1825. Later that year, the Canal Commissioners hired for the canal project a principal engineer and two resident engineers. One of the resident engineers was Samuel Forrer. But how did M. T. Williams know the Howard family? After all, Sarah was staying at his home, apparently—which, by the way, was on Fifth Street between Walnut and Vine, in 1825. Samuel Williams, “Micajah Terrell Williams: A Sketch,”Wisconsin Magazine of History 6, no. 3 (Mar. 1923): 303-313. Harry N. Scheiber, “Entrepreneurship and Western Development: The Case of Micajah T. Williams,” The Business History Review 37, no. 4 (winter 1963): 345-368. Frank W. Trevorrow, Ohio’s Canals: History, Description, Biography (Oberlin: s. n., 1973). Ohio State Archaeological and Historical Society, History of the Ohio Canals, their construction, cost, use and partial abandonment (Columbus: Press of F. J. Heer, 1905). As it turned out, Micajah Williams was of Quaker descent. His family came from North Carolina—which perked my ears at first, since Horton Howard was originally from North Carolina. However, a check of Hinshaw’s Quaker Encyclopedia again showed that their families lived nowhere near each other (as in, opposite ends of the state). But I did find that Micajah T. Williams was married in the Plainfield Monthly Meeting to Hannah Jones in 1818. Plainfield struck a chord—the Howards had belonged to that meeting at one time—during the same time frame, in fact (1815-1820). Coincidentally—well, if you consider the alphabet a coincidence—the Howard records and the Jones marriage were listed on the exact same page in Hinshaw: Volume 4, page 338. That could possibly explain how they knew each other; they had ties to the same Quaker congregation. However it came about, clearly Horton Howard and M. T. Williams knew each other somehow, because I’m sure Horton wouldn’t let his daughter board with just anyone. And why was she staying with him anyway? Horton writes later on in the same letter: “I am doing all I can to aid the Canal Commissioners and the Commissioner of the Canal fund or rather to procure the enlargement of their powers, with I think a good prospect of success…” So it looks like Horton had some affiliation with the canal project himself. I wonder what it was? Still more mysteries. Well, I hope you have enjoyed reading about my little exploration and investigation surrounding the marriage of Samuel Forrer and Sarah Howard. I’m sure this won’t be the last you hear from me on the Forrer-Peirce-Wood Collection. I think I’m only about 1/3 of the way through it so far. However, I do hope not to need 5 parts the next time I want to mention it! A lot can happen in 14 years. For instance, in the 14 years between 1793 and 1807, the following happened: the Treaty of Greenville (1795) opened Ohio up for more settlement; the city of Dayton, Ohio, was founded (1796); George Washington died (1799); the Library of Congress was founded (1800); Ohio became a state (1803); Thomas Jefferson made the Louisiana Purchase (1803), doubling the size of the United States’ territory; and Lewis and Clark set out on their famous adventure (1804). Why did I choose the arbitrary-sounding dates of 1793 and 1807? Because those are the years in which Samuel Forrer and Sarah Howard were born, respectively. He was 14 years older than her, and at the time of their marriage, he was 33, and she was 18. And actually: they were married in February, and Sarah had only just turned 18 the previous December. I know I promised previously that Part 4 would be the final installment, and so as to keep that promise, I am cleverly deeming this “Part 3B,” and still reserving “Part 4” for a discussion of the men mentioned in Samuel’s second letter, as intended. I noticed the age disparity sometime after writing Part 3 and decided that it really deserved a discussion. I wonder how a father might view the situation, if a 33-year-old man wanted to marry his 18-year-old daughter. Today a dad might object purely on creepiness factor. (The would-be groom was probably already starting to think about shaving the year his prospective bride had been born.) However, that is looking at it with twenty-first century eyes and cultural norms. But would it have been considered odd in the 1820s? I’m not going to answer, because I don’t know. I couldn’t find any good statistics on the matter from the time period at hand, although the CDC has an interesting document – “Marriages: Trends and Characteristics” – but it only covers 1867-1967. This document states at one point: “Men marry later in life than women” (p. 13), which seems like an almost obvious “duh,” but I suppose bears actually stating explicitly if you are going to bother writing up an analysis of statistics on the subject. J. William Frost writes in The Quaker Family in Colonial America (1973) that “the average age for Quaker women [to be married] was 22.8 and for men 26.5; the median age for women was 20.5 and for men 24” (p. 151). He states this in contrast to “the popular stereotype of colonial women marrying in their teens, bearing a dozen children, and then dying young” (p. 151). But again, as I said in Part 2 when I mentioned Frost before, you can only extrapolate so much from Frost to the Forrer/Howard situation, since he was writing about the colonial era, of which 1826 is not a part. Furthermore, though Sarah was a Quaker, Samuel was not. But part of the reason that I bring all of this up is point out something about primary sources (e.g., letters, diaries, oral history interviews). Primary sources constitute first-hand information. Is that better than second-hand information? (Remember the telephone game in kindergarten?) Sure, it probably is. But is it always 100% accurate? Not necessarily. You have to remember to watch out for fallacies in the information from, well, just being human. There can be errors of memory (reconstructing things over time), perception (“I thought I saw…”), or estimation (fish tales, anyone? and some people, like me, are just genuinely bad at estimating sizes). You could be reading a primary source and the author gives a reason that he or she thinks something might be true; their perception of “why” something happened or why someone else did something. But how do you know they are correct? There are a lot of factors that go into the degree to which you can trust their assessment but the bottom line is: you don’t, really. When I wrote Part 2, I focused on whether or not Horton Howard would disapprove of Samuel Forrer marrying his daughter Sarah simply on the basis of Samuel’s not being a Quaker. Why did I do that? Well, it does seem to be the most obvious reason for Horton’s disapproval. But I didn’t know much of anything about Quakers before I got into this, so how did I even know that might be an issue? 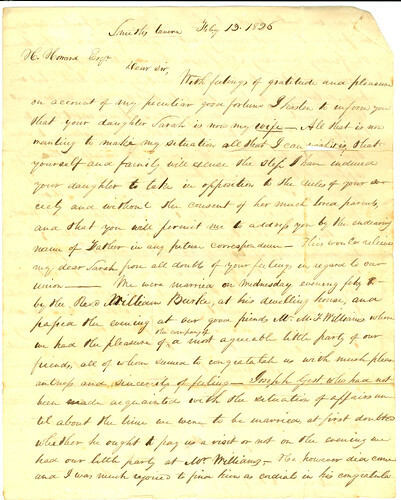 But what I do not have, as I have said all along, is the letter that Horton wrote back, stating not only his answer but (hopefully) his reasoning. And that would be the most trustworthy source for Horton’s reason: a letter written by him, stating, “I disapprove, and here’s why.” Do I imagine that the objection was probably for the exact reason that Samuel expected? Sure, it probably was. But could it have been for a different reason—like the age difference. Which, come to think of it, did Horton even know Samuel’s exact age? They seem to have had at least a few mutual friends—which I will get to in Part 4—so I suppose it is logical to assume that someone could have given him at least an approximation of the man’s age if he had asked for it. Back to the idea of factors weighing into whether or not you trust the writer’s assessment. Let’s not forget Samuel’s beloved Sarah. We might assume that Samuel knew Sarah well, and one would think that Sarah probably knew her father well. Perhaps Samuel assumed that Horton would disapprove on religious grounds because Sarah has told him so. Can’t you just imagine them? Samuel’s just floated the idea of marriage, and at first Sarah’s all giddy, but then she gets somber and informs him, “My father will never consent to it, since you’re not a Quaker, but we have to at least ask him.” Now I have this image of her perched over his shoulder as he scribbled down that draft. Perhaps her suggestions even resulted in some of the strikethroughs? See, now I’m drifting into the realm of total, unfounded, imaginative speculation. I get lost in it, I really do. I can imagine how long it has taken you readers to sift through the details of these last several posts. And hopefully they do not come off as completely scatter-brained. But even as long as they may take to read, I’ve spent quite a lot more time reading and researching and stewing on the matter myself, and then I had to try to unwind the web of thoughts into some kind of halfway-intelligent narrative.